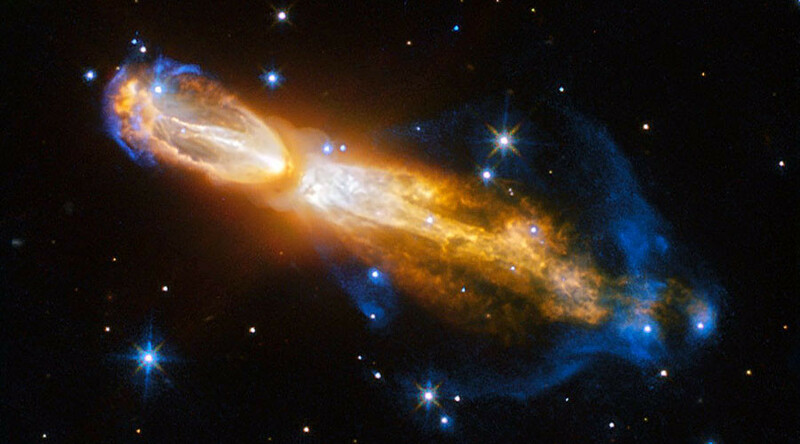 The violent death of a star has been captured in an astonishing image by the Hubble Space Telescope, showing the spectacular transformation of the Calabash Nebula as it blows dust and gas into space. Situated more than 5,000 light years from Earth, the celestial form is nicknamed the ‘Rotten Egg’ Nebula due to its high sulphur levels. Its rapid transformation is occurring over a span of 1,000 years – a mere blink of the eye in astronomical terms. The yellow gas seen being emitted from the nebula is moving at 1 million kph (621,000 mph), according to the ESA. Over the next 1,000 years a fully formed planetary nebula is expected to be produced by the transformation. NASA and the ESA’s Hubble Space Telescope produced the stunning image. Last year the telescope also captured the death of NGC 2440, a burnt-out star encased in a cocoon of it’s own gas.